As our “Around the World” program kicked off last night, it seemed as though all of GYV’s diversity was on full display. 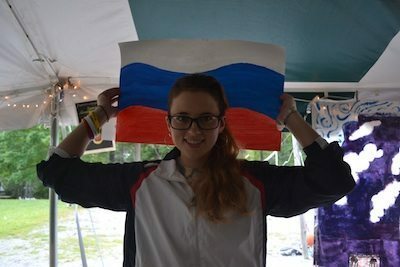 There were booths featuring Puerto Rico, the Dominican Republic, Yemen, Russia, Japan, the United States, Poland, Scotland, and Nigeria, and each was manned by a camper or staff representative from that area. The tables were filled with books, toys, pictures, and other knickknacks and souvenirs, each providing it’s own insight into another culture and piece of the world. Campers were given “passports” and at each station were tasked with finding out some piece of information, learning a new phrase, or trying a cultural craft activity. They learned how to say “I love you” in Japanese, tested their United States trivia knowledge, and even tried their hand at Polish paper cutting. The youth mixed and mingled visiting each booth, discovering more about their peers’ backgrounds, and appreciating the wealth of cultural diversity found amongst their friends. The evening was also interspersed with a variety of cultural dances. The youth got to see an upbeat salsa from Puerto Rico, a lively merengue from the Dominican Republic, and a traditional Native American dance from the Crow tribe in Montana. For this last dance the campers were all invited to participate as well in what is called a “circle dance”. As the music played and the chanting over the speakers grew louder, the campers slowly found their rhythm. Despite their unfamiliarity with the dance, they shrugged off any anxiety and found themselves enjoying the opportunity to share in this special moment. Many of the campers said they appreciated the opportunity to showcase their culture, and their peers appreciated the opportunity to learn more and ask questions. Youth come from all over the world to GYV to participate in engaging workshops, learn leadership skills, and try new activities. “Around the World” night provides an opportunity to turn the focus back onto the youth and celebrate the many perspectives, traditions, and customs they bring with them. And once again we are reminded-what an interesting and diverse group we have!